Can I see my missed calls? No, unfortunately not yet, but our developers are currently working on it. Does Simlar encrypt all phone calls? No. 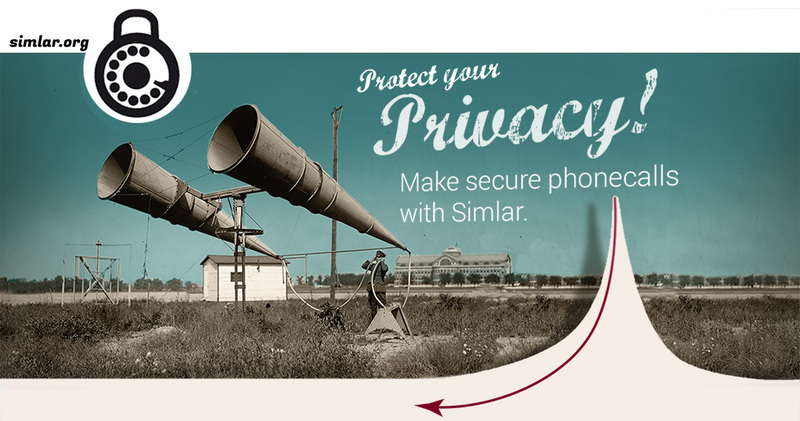 Simlar encrypts only phone calls you make using Simlar. Is it possible to spy on my Simlar calls? The Simlar connection itself is encrypted and it’s not possible to spy on it. But third party software on your phone could get the voice from your microphone directly. If you have no spyware on your phone, the Simlar call is tap-proof! How much bandwidth does Simlar use? Simlar is using 4kb/s upload and 4kb/s download. The average traffic corresponds to 1 megabyte for a 2-minute call. Why do I need the SMS? The SMS is required for registration purposes. If the registration code is not automatically read in the SMS, you can enter it manually. The call quality was poor. The voice quality always depends on the Internet connection. The better the connection, the better the voice quality. Send an email with the Google Mail address of the mobile phone to devel@simlar.org. How can I support Simlar? Help us improve Simlar. Use the app as much as possible and tell your friends about it. All suggestions are welcome, whether for source code, text or design. Our developers also look forward to getting any smart phone that you no longer need. Yes. We have successfully tested it in several European countries. Try it yourself. The best and cheapest way is to always use WLAN. Because the server is located in Germany, this could lead to latency issues for distant countries. Does Simlar work on mobile Internet? Yes. However, the voice quality is reduced if the Internet connection is poor. Please note: Not all mobile service providers allow VoIP. Check with your provider first. In our tests in Germany, it worked well with E-Plus, O2 and Vodafone. The code does not match that of the called party. Check your code again. If it really doesn’t match then there is a possibility that the call is being monitored. What is the purpose of the tune just before the call starts? The tune bridges the short amount of time that Simlar needs to encrypt the call. During the call, it is possible to reduce the echo by adjusting the volume settings in the app.